A little less humid out today, then Saturday a high in the 60’s! That’s my type of weather. After Breakfast did a couple of loads of laundry for Mom. On outside and cleaned up around the house. Everything done and them had to go to the bank and took a drive over to a part of West Chester called the “Streets of West Chester”. It’s a retail and entertainment center and they had broke ground on a huge golf center and I wanted to see where it was exactly. A whole lot of construction going on all over the area. 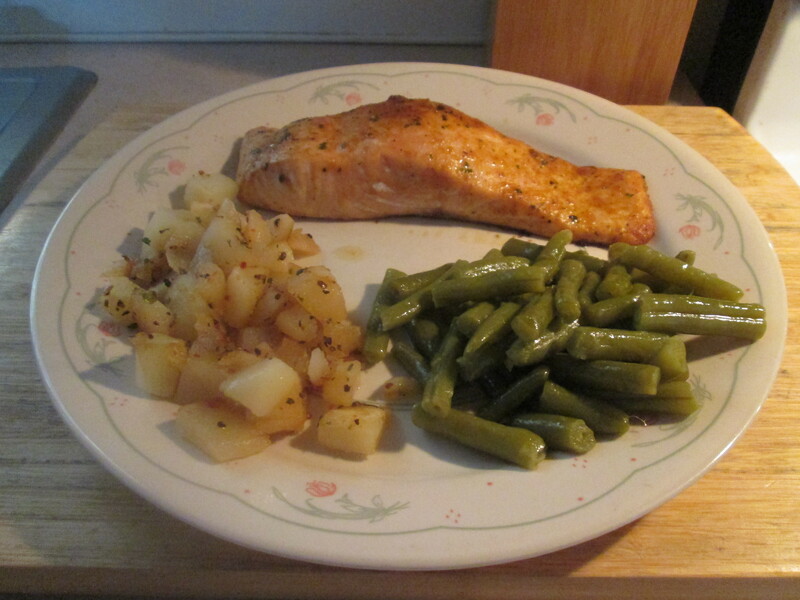 So for dinner tonight I prepared a Thai Chili Seasoned Baked Salmon w/ Steakhouse Seasoned Diced Potatoes and Cut Green Beans. 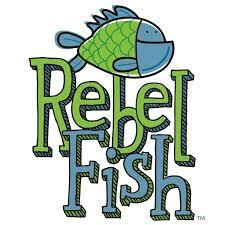 I had come across Rebel Fish a while back at Kroger. It was in the Seafood Department and it’s a Salmon Fillet seasoned with a Thai Chili Rub. The rub has blend of sweet coconut milk, spicy chili and zesty lemongrass. Rebel Fish has 6 different Rubs, I’ve tried the Thai and Blackened so far. You can prepare by the Microwave or by Oven, I opted to go with the oven prep. To start preheat oven to 400°F. 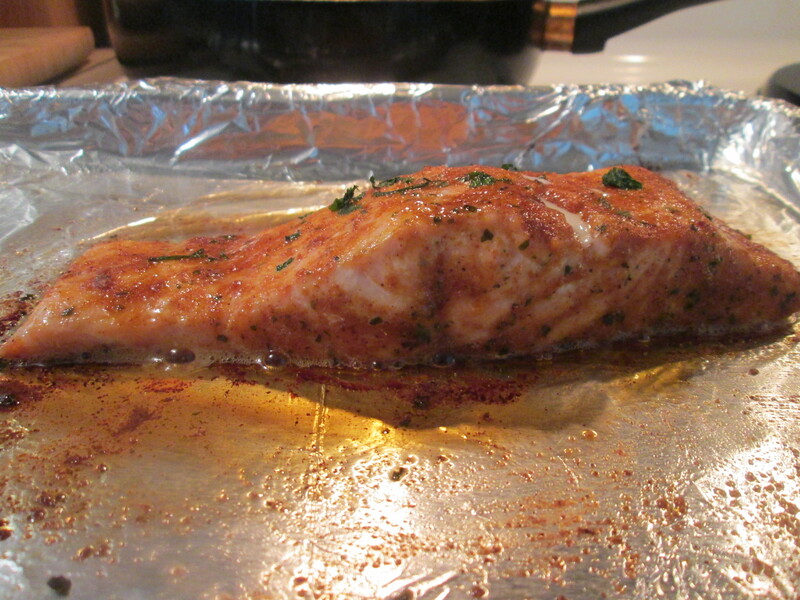 Cut away soft film from tray; remove salmon and place on a foil-lined baking sheet. Discarded the extra liquid in pouch. Shake the seasoning pouch to make sure contents flow freely and sprinkle over salmon. Using the back of a spoon press to adhere seasonings to fish. Bake for 12-15 minutes, until salmon is cooked through (internal temperature of 145°), and flakes easily. Very little mess to clean up, easy to prepare, and it’s delicious! Excellent seasoning, nice heat to it but not overpowering. I’ll have to keep this in stock. 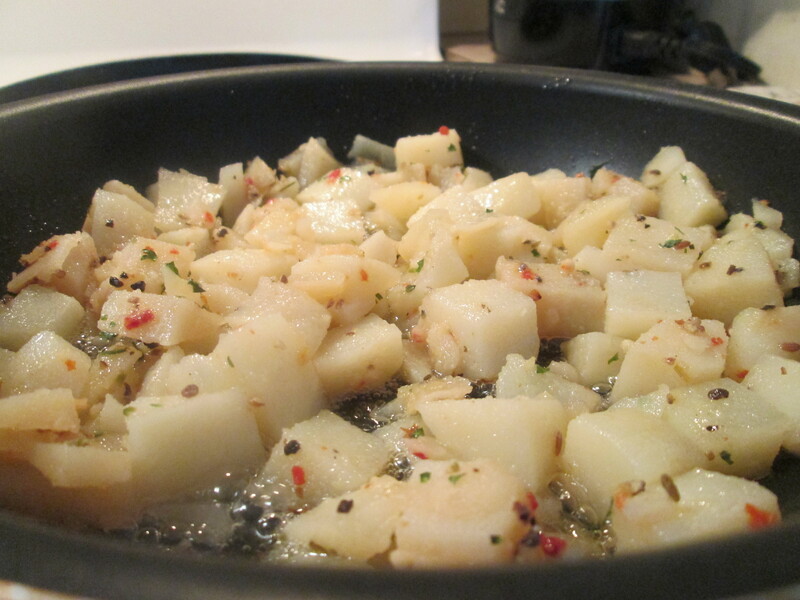 For one side dish I prepared some Simply Potatoes Steakhouse Seasoned Diced Potatoes. Just love using all the Simply Potatoes Products, always fresh and always and delicious Potato Dish. Then I also heated up a can of Del Monte Cut Green Beans. For dessert later a Jello Sugar Free Dark Chocolate Pudding topped with Cool Whip Free. Preparing fresh fish should be easy, super easy. That is why we created Rebel Fish, fresh salmon that’s ready to eat in just 90 seconds. Paired perfectly with complementary seasonings, Rebel Fish salmon was inspired by restaurants and global culinary flavors. Spicy, zesty, and sweet. Your senses aren’t going to know what hit ‘em. An exotic blend of sweet coconut milk, spicy chili and zesty lemongrass. This lively flavor combination adds the perfect amount of heat and spice to your salmon! 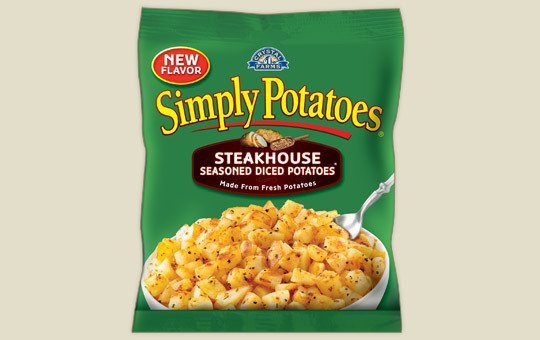 We peel and dice fresh potatoes and add just enough delicate onion, red bell pepper and garlic to make our Simply Potatoes Steakhouse Seasoned Diced Potatoes. They make the perfect side dish to go from skillet to table. We’ve already done all the washing, peeling, dicing and spicing so you don’t have to. Another beautiful day out but a little hotter out, about 85 degrees today but low humidity. That ends tomorrow as the high humidity and heat returns, Blah! After Breakfast this morning ran to Kroger for Mom and picked up a couple of items for myself. Back home it was laundry and clean the house day. 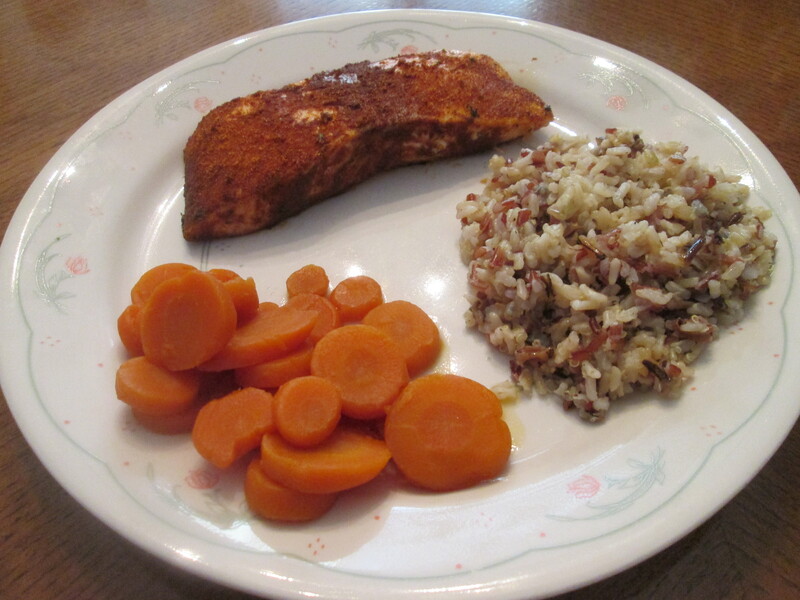 For dinner tonight I prepared a Cajun Blackened Salmon w/ Multi – Grain Medley and Sliced Carrots. 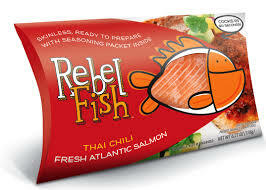 I tried the Rebel Fish – Thai Chili Salmon a couple of weeks ago and couldn’t wait to try the other seasoned salmon. 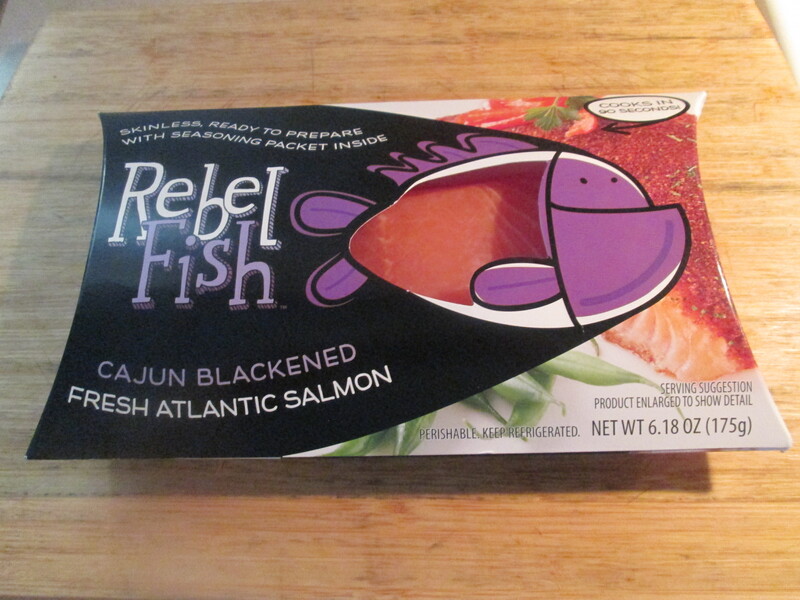 So tonight I prepared the Rebel Fish – Cajun Blackened Salmon. To start preheated the oven to 400°F. 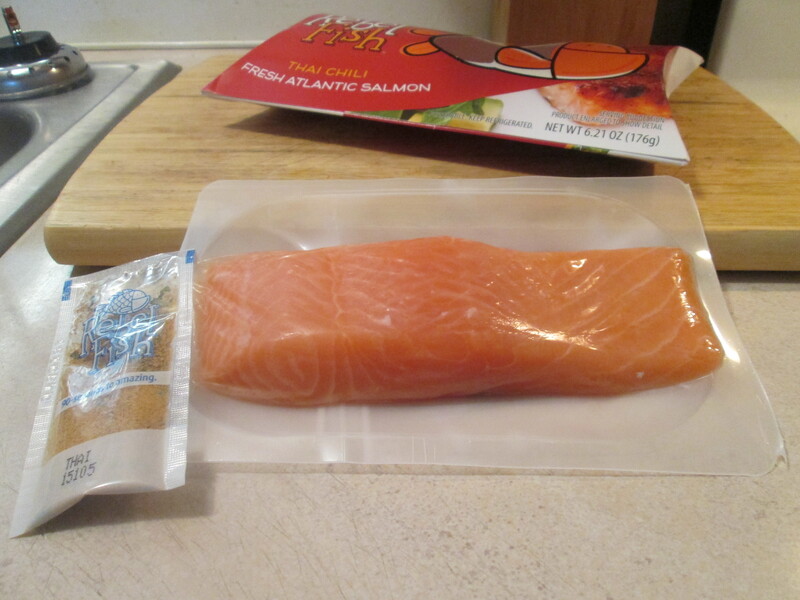 Cut away soft film from tray; remove salmon and place on a foil-lined baking sheet. Discarded the extra liquid in pouch. 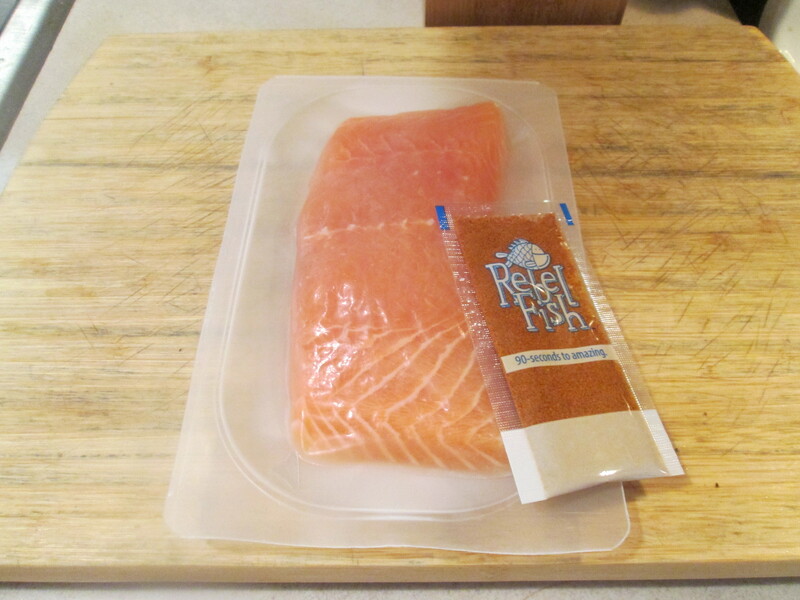 Shake the seasoning pouch to make sure contents flow freely and sprinkle over salmon. Using the back of a spoon press to adhere seasonings to fish. Bake for 12-15 minutes, until salmon is cooked through (internal temperature of 145°), and flakes easily. Very little mess to clean up, easy to prepare, and it’s delicious! Excellent seasoning, nice blackening seasoning and heat to it but not overpowering. This is a great item to have in the freezer or fridge. 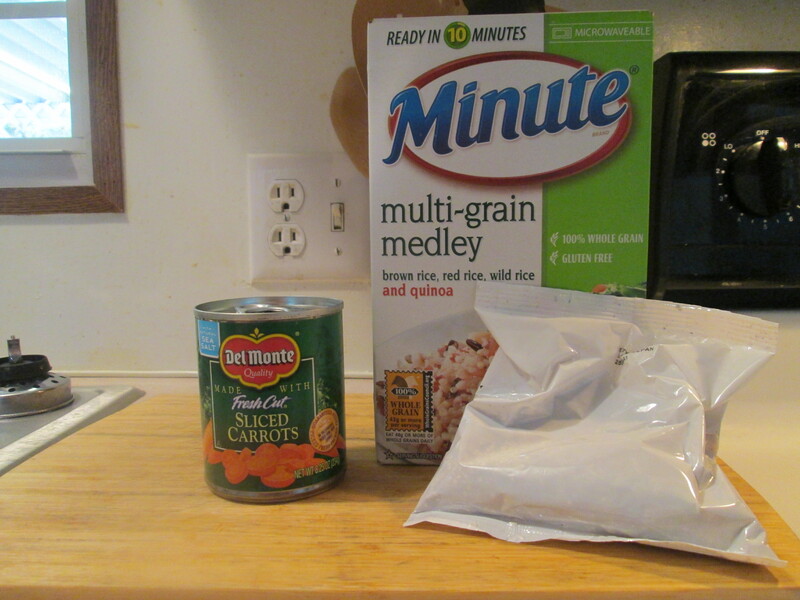 For one side I prepared a bag of the Minute Whole-Grain Medley. This has instantly become one of my favorites. It has Brown Rice, Thai Red Rice, Wild Rice, and Quinoa. Now that’s a good combo of Grains! The box contains 4 – 2 Serving Packets and easy to prepare. Combine water and the contents of one bag in medium saucepan and stir. Add oil if desired. Or, if desired, to add more flavor, substitute broth, fruit or vegetable juice for water. Bring to a boil, reduce heat, cover and simmer 10 MINUTES or until water is absorbed. Remove from heat. Fluff with fork and serve! Easy to prepare and makes one excellent side dish. Then I also Heated up a small can of Del Monte Sliced Carrots. For dessert later a Jello Sugar Free Dark Chocolate Pudding topped with Cool Whip Free. Spicy, Cajun and Blackened. This rub will kick you right in your taste buds. A slightly spicy Cajun blend of red, white, and black pepper, chile de arbol, tomato, spices, and garlic. It’ll add just the right amount of kick to your salmon!